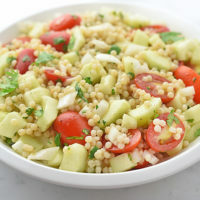 This easy summery Cucumber Tomato Couscous recipe is super simple to prepare with a fresh bite, perfect for a BBQ or weekday meal. Confession time. Until recently, I had never made couscous. “What?! ?,” you say. I know, crazy huh? I have enjoyed a couscous recipe on the occasion it showed up at a potluck. It has always been tasty. It’s just that couscous has always seemed cooler and fancier than it really is. But essentially, it’s pasta. Itty bitty pasta. Of course, I’m simplifying couscous quite a bit. Traditionally, couscous was handmade by rolling a ground grain dampened with water into small pellets, then lightly coated with flour to avoid the pellets sticking together. A little bit different than pasta, but essentially the same ingredients. Here in the United States, we typically find instant or quick cooking versions of Israeli (or pearl) couscous made from wheat available in most grocery stores. For that reason I think of it as a pasta. And yay for pasta! Even itty bitty pasta. Pasta salad is 100% my favorite summer BBQ side dish (tied with potato salad). Couscous just makes it a bit more fun and fancy. AND easier! Couscous takes very little time to cook. 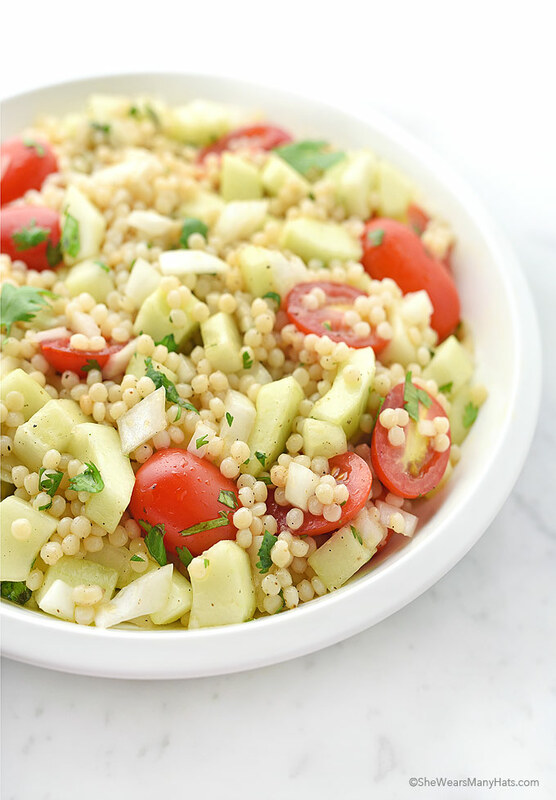 So this Easy Cucumber Tomato Couscous Recipe can be ready in no time. This couscous recipe couldn’t be easier. Couscous takes a few minutes to cook and then you’re ready to mix everything together. While the couscous is cooking, whisk together the olive oil, red wine vinegar, salt and pepper in a mixing bowl. Once the couscous has cooked, add it to the mixing bowl along with the cucumber, tomatoes, onion and cilantro. Toss to incorporate, and enjoy! 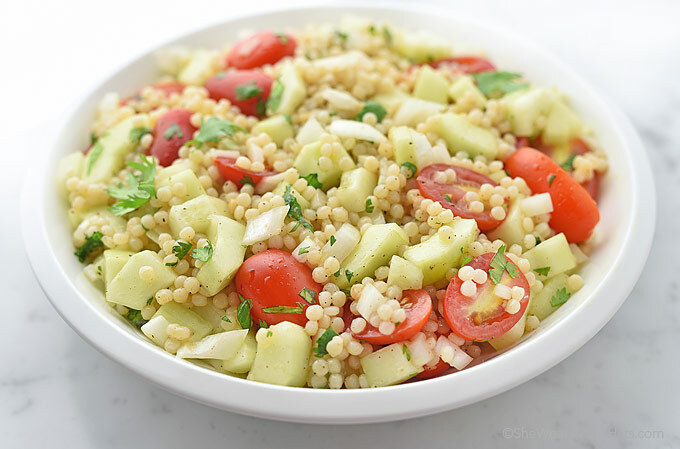 Made with cucumbers, tomatoes, onion and cilantro (or basil), this Cucumber Tomato Couscous Recipe has the fresh taste of summer and is oh so satisfying. You can easily make it a day ahead of time, allowing it to mingle a bit. It stores and travels well, so it’s practically made for picnics! Happy couscous-ing! 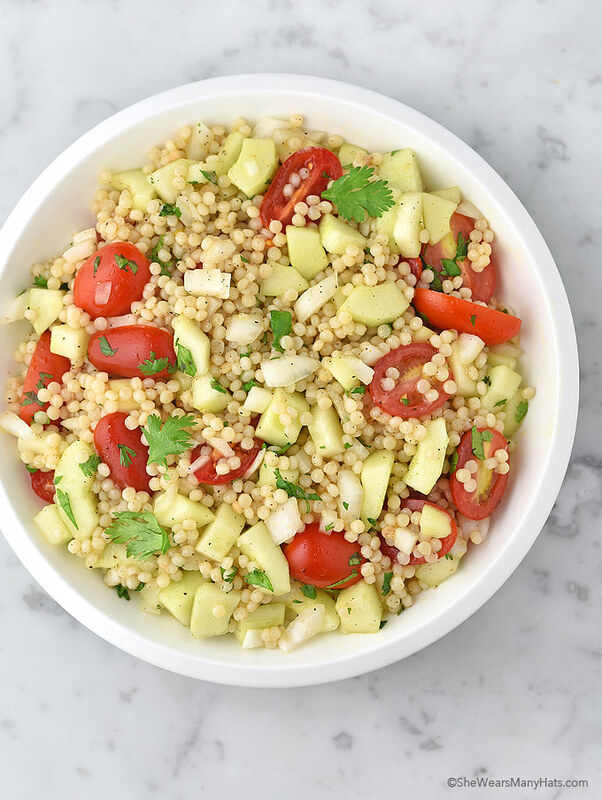 Made with cucumbers, tomatoes, onion and cilantro, this easy couscous recipe has the fresh taste of summer and is oh so satisfying. Cook couscous according to package instructions. While couscous is cooking, in a mixing bowl whisk together olive oil, red wine vinegar, salt, and pepper. Once couscous has cooked add to mixing bowl along with cucumber, tomatoes, onion and cilantro; toss to incorporate. *Cilantro may be substituted with fresh basil or parsley. Originally published June 7, 2017. Can I use some other vinegar rather than red wine vinegar ? Is it ok to make this a day ahead and serve cold? 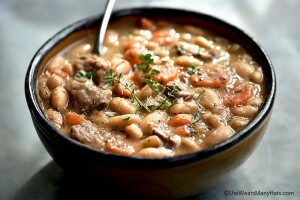 I made this and it is so good, my husband and kids loved it! This will be my go to dish to take to parties this Summer. This recipe is super easy and delicious. My whole family enjoyed it. I substituted Basil because I had run out of cilantro.